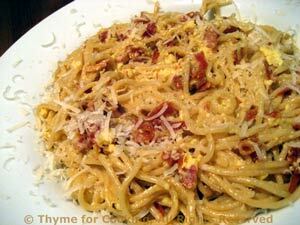 Easy Dinner from Thyme for Cooking: Spaghetti Carbonara. Put the water on and go do something while it comes to a boil. The sauce goes together while the pasta cooks. It's simple, a bit decadent and delicious. The fruit rounds out the meal.